The objective of the present study was to determine the views of pre-service preschool teachers on Integrated Science Technology Engineering and Mathematics (STEM) education and their tendencies about integrated STEM instruction. The study group included 35 pre-service preschool teachers. The present study, conducted as a single group research model with pre-test-post-test experimental method, was completed in 8 weeks. Semi-structured interview form developed by the authors and the "Integrated STEM Instructional Tendencies Scale" developed by Lin and Williams (2016) adapted to Turkish by Hacıömeroğlu and Bulut (2016) were used as data collection instruments. The qualitative data obtained are described with the content analysis methodology. The quantitative data were analyzed with paired sample t-test. After the implementation of the STEM education program, it was determined that pre-service preschool teachers had positive views on STEM education approach in general. Furthermore, it was determined that STEM education would encourage student to think, transform theoretical knowledge into practice, and to acquire the skills to obtain concrete products using the theoretical knowledge that they acquired in the class. The majority of the participating pre-service teachers indicated that undergraduate programs should include science, technology, engineering and mathematics courses, teachers from different fields should collaborate, and the teachers should receive STEM training. Akbaba, C. (2017). Okullarda maker ve steam eğitim hareketlerinin incelenmesi. Master Project, Trakya University. Breiner, J. M., Harkness, S. S., Johnson, C. C. & Koehler, C. M. (2012). What Is STEM? A Discussion about conceptions of STEM in education and partnerships. School Science and Mathematics, 112(1), 3-11. Brown, E.T. (2005). The influence of teachers’ efficacy and beliefs regarding mathematics instruction in the early childhood classroom. Journal of Early Childhood Teacher Education, 26(3), 239–257. Bicer, A., Navruz, B., Capraro, R., & Capraro, M. (2014). STEM schools vs. non-STEM schools: Comparing students mathematics state based test performance. 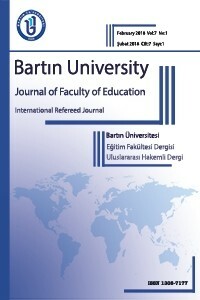 International Journal of Global Education, 3(3), 8-19. Bybee, R. W. (2010). What is STEM education? Science, 329(5995), 996-996. Caprile, M., Palmen, R., Sanz, R., & Dente, G. (2015). Encouraging STEM studies for the labour market. Retrieved 25 November 2017, from http://www.europarl.europa.eu/RegData/etudes/STUD/2015/542199/IPOL_STU(2015)542199_EN.pdf. Chesloff, JD. (2013). Why STEM education must start in early childhood. Education Week, 32 (23), 27–32. Creswell, J. W. (2012). Educational research: Planning, conducting, and evaluating quantitative and qualitative research (4th ed.). Boston, Pearson. Cohen, L. & Manion, L. (1997). Reseacrh methods in education (4th ed.). London and New York, Routledge. Corlu, M. S., Capraro, R. M., & Capraro, M. M. (2014). Introducing STEM education: Implications for educating our teachers for the age of innovation. Egitim ve Bilim, 39 (171). Cotabish, A., Dailey, D., Robinson, A., & Hughes, G. (2013). The effects of a STEM intervention on elementary students’ science knowledge and skills. School Science and Mathematics, 113, 215-226. Çınar, S., Pırasa, N., & Sadoğlu, G. P. (2016). Views of science and mathematics preservice teachers regarding STEM. Universal Journal of Educational Research, 4 (6), 1479- 1487. Erdoğan, İ. & Çiftçi, A. (2017). Investigating the Views of Pre-service Science Teachers on STEM Education Practices. International Journal of Environmental and Science Education, 12 (5), 1055-1065. Elliott, B., Oty, K., McArthur, J., & Clark, B. (2001). The effect of an interdisciplinary algebra/science course on students' problem solving skills, critical thinking skills and attitudes towards mathematics. International Journal of Mathematical Education in Science and Technology, 32 (6), 811- 816. Fenty, N., & Anderson, E.M. (2014). Examining educators’ knowledge, beliefs, and practices about using technology with young children. Journal of Early Childhood Teacher Education. 35 (2), 114–134. Fraenkel, J. R., Wallen, N. E., & Hyun, H.H. (2012). How to design and evaluate research in education (8th ed ). Mc Graw Hill Higher Education, New York, ABD. Gay, L. R. (1996). Educational research, competencies for analysis and application (5th Edition). OHIO: Merrill an imprint of Prentice Hall. Gay, L. R., & Airasian, P. (2000). Educational research competencies for analysis and application (6th Edition). Ohio: Merrill an imprint of Prentice Hall. Gebbie, D.H., Ceglowski, D., Taylor, L.K., & Miels, J. (2012). The role of teacher efficacy in strengthening classroom support for preschool children with disabilities who exhibit challenging behaviors. Early Childhood Education Journal. 40 (1), 35–46. Genç, Z. & Uğraş, M. (2017). STEM Education Must Start in Early Childhood: Opinions and Attitudes of Preschool Teacher Candidates. VI lnternational Conference Early Childhood Саsе and Education. 10-13.05.2017. Rusya. Hacıömeroğlu, G. (2017). Examining Elementary Pre-service Teachers’ Science, Technology, Engineering, and Mathematics (STEM) Teaching Intention. International Online Journal of Educational Sciences. Katehi, Linda; Pearson, Greg., & Feder, Michael (Eds.). (2009). Engineering in K-12 education: Understanding the status and improving the prospects. Washington, DC: National Academies Press. Katehi, L., Pearson, G., & Feder, M. (Eds.) (2009). Engineering in K-12 education: Understanding the status and improving the prospects. Washington, DC: The National Academies Press. Kennedy, T.J., & Odell, M. R.L. (2014). Engaging Students In STEM Education. Science Education International, 25 (3). 246-258. Kızılay, E. (2016). Fen bilgisi öğretmen adaylarının FETEMM alanları ve eğitimi hakkındaki görüşleri [Pre-service science teachers’ opinions about STEM disciplines and education]. The Journal of Academic Social Science Studies, 47, 403-417. Lang, M. (1992). Computer readiness of teachers. Computers & Education, 19(3), 301–308. Lantz, H.B. (2009). Science, Technology, Engineering, and Mathematics (STEM) Education: What form? What function? Retrieved 15 November 2017, from: http://www.currtechintegrations.com/pdf/STEMEducationArticle.pdf. Lind, K.K. (1999) Science in early childhood: developing and acquiring fundamental concepts and skills. In: Dialogue on Early Childhood Science, Mathematics, and Technology Education: First Experience in Science, Mathematics, and Technology. Washington, DC: American Association for the Advancement of Science. Available at: http://www.project2061.org/publications/earlychild/online/experience/lind. htm (accessed 15.02.2018). Miles, MB., & Huberman, A.M. (1994). Qualitative Data Analysis (2nd edition). Thousand Oaks, CA: Sage Publications. Nathan, M. J., Tran, N. A., Atwood, A. K., Prevost, A., & Phelps, L. A. (2010). Beliefs and expectations about engineering preparation exhibited by high school science, mathematics, and technical education teachers. Journal of Engineering Education, 99 (4), 409–436. National Research Council. (2014). STEM learning is everywhere: Summary of a convocation on building learning systems. Washington, DC: National Academies Press. New RS. (1999). Playing fair and square: issues of equity in preschool mathematics, science, and technology. In: Dialogue on Early Childhood Science, Mathematics, and Technology Education: Fostering High Quality Programs. Washington, DC: American Association for the Advancement of Science. Available at: http://www.project2061.org/publications/earlychild/online/fostering/new.htm (accessed 15 January 2018). Fenty, N.S., & Anderson, E. M. (2014). Examining Educators’ Knowledge, Beliefs, and Practices About Using Technology With Young Children. Journal of Early Childhood Teacher Education, 35 (2), 114-134, DOI: 10.1080/10901027.2014.905808. Olivarez, N. (2012). The impact of a STEM program on academic achievement of eighth grade students in a South Texas middle school. (Doctoral dissertation), Texas A & M University. Park, M., Dimitrov, D.M., Patterson, L.G., & Park, D. (2017). Early childhood teachers’ beliefs about readiness for teaching science, technology, engineering, and mathematics. Journal of Early Childhood Research, 15 (3) 275–291. Park, M., Nam, Y., Moore, T. J., & Roehring, G. (2011). The impact of integrating engineering into science learning on student’s conceptual understandings of the concept of heat transfer. Journal of the Korean Society of Earth Science Education, 4 (2),89-101. Paulson, A. (2012). Transition to college: Nonacademic factors that influence persistence for underprepared community college students. (Doctoral dissertation). Retrieved from: http://0-search.proquest.com.library.unl.edu/docview/3546033Royal Society Science Policy Centre. (2014). Vision for science and mathematics education. London, UK: Author. Roberts, A. (2012). A justification for STEM education. Technology and Engineering Teacher, 71 (8), 1-4. Royal Society Science Policy Centre Report (2014). Vision for science and mathematics education. London, The Royal Society. Şahin, A., Ayar, M. C. & Adıguzel, T. (2014). STEM related after-school program activities and associated outcomes on student learning. Educational Sciences: Theory & Practice, 14 (1), 309-322. Schreier, M. (2014). Qualitative content analysis. In U. Flick (Ed. ), The SAGE Handbook of Qualitative Data Analysis. London: SAGE.Shea, J. A., Arnold, L., & Mann, K. V. (2004). A RIME perspective on the quality and relevance of current and future medical education research. Academic Medicine, 79, 931–938. Timur, B. (2012). Determination of factors affecting preschool teacher candidates’ attitudes toward science teaching. Educational Sciences: Theory and Practice, 12 (4), 2997–3009. Ugras, M. (2017). Okul öncesi öğretmenlerinin STEM uygulamalarına yönelik görüşleri [Preschool teachers’ views about STEM applications]. The Journal of New Trends in Educational Science, 1 (1). 39-54. Wang, H. H., Moore, T. J., Roehrig, G. H., & Park, M. S. (2011). STEM integration: Teacher perceptions and practice. Journal of Pre-Collage Engineering Education Research, 1 (2), 1-13.